Our tractor fleet comprises of late model Freightliner Columbias and Cascadias. The majority of our tractors are Detroit powered and a minority are equipped with Mercedes Benz. We utilize both sleepers for our regional drivers and day cabs for our local runs. 150 + dry bulk trailers. Most of which are dedicated to the lime industry. 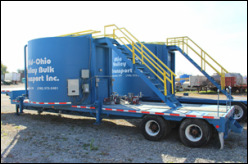 Our trailers range in size from 1050 cubic feet to 2000 cubic feet and equipped with 6 or 8 hopper valves and 4 unloading pipes. Capable of unloading pneumatically or via bottom-drop. We currently are running 15 deep drop liquid tankers dedicated to hauling lime slurry. Most are 5500-6500 gallons. All deep-drop liquid tankers are equipped with liquid pumps to aid in quick unloading capability. In addition to our bulk and liquid services, we also utilize a small number of flatbed and van trailers to service customers that require commodities packaged in super sacks, pallets of 50 lb. bags, etc. 4000 gallon lime slurry straight truck used for delivering to difficult destinations where tractor trailers are unable to operate. Storage Pig: 2100 cubic foot storage pig available for short and long term rental. 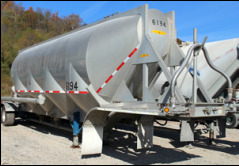 Trial Units: We also custom build portable, liquid mix tank trailers. The capacity of each trial unit varies from 6500-8000 gallons of capacity. Each trailer is equipped with mixer, 2 and 3 unloading ports, varying voltage electric hook-up capability, leveling dollies, etc. Contact us for more information and to see if one of our trial units can assist you in your operations. 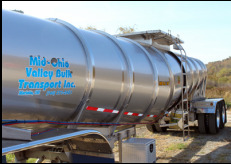 Vac-Trailer: We have one pneumatic bulk tanker equipped with the ability to vacuum product from a train cars, silos, bulk tankers, etc. Super Tankers: Four of our larger volume bulk tankers are equipped with 4 axles, some of them liftable and steerable which enables us to haul heavier payloads in Michigan, Indiana, and Ontario. We buy and sell silos and mix tanks that can be utilized for a variety of industries. Please contact us for any questions you may have about our inventory and availability. We always have various equipment for sale. Typically our availability includes: older model tractors, silos, mix-tanks, used heavy equipment such as cranes, electric blowers, heavy duty compressors, trial units, etc. Contact us for a list of available equipment.